In the last two posts, we’ve been discussing Daniel, Hananiah, Azariah, and Mishael—the four Hebrew princes taken captive to Babylon. We’ve discussed their spiritual resolve to not assimilate as well as the God-Factor, both of which allowed them to excel to the top positions in Babylonian government. Today, we’ll be discussing a similar prince in a similar situation. Joseph, the son of Jacob, the son of Isaac, the son of Abraham, was transplanted against his will to Egypt, the empire that controlled the world at that time, as a mere slave. Sold by his brothers to his distant cousins, the Ishmaelites and Midianites, they bought him to Egypt and sold the 17 year old to Potiphar, a chief officer in Pharaoh’s government. For the full story, read Genesis 37; 39-47. While in Potiphar’s home, he rose above all the other common slaves and slave masters until he became the governor of Potiphar’s estate. His power was so widespread that the Bible tells us Potiphar only worried about what he had to eat (Genesis 39:6). Potiphar did well to utilize Joseph’s talents in his home; unfortunately, Potiphar’s wife took notice of Joseph and believed him to have “special talents” as well. So she threw herself at him. This is where Joseph’s integrity and quality truly shined through. Had Joseph forgotten his God and his integrity, he could have easily become puffed up with his talents and gifts without repentance that are without repentance (Romans 11:29), but Joseph feared the Lord and respected Potiphar, so he ran. And what did Joseph get for his integrity? Slammed in jail. But God looked out for Joseph and even though he was technically a prisoner, he rose to the same position as governor in the prison. The warden favoured Joseph so much so that he entrusted Pharaoh’s imprisoned cup bearer and baker into his care. While in prison, both servants had two seemingly similar dreams, but with drastically different results. God enabled the young man to interpret their dreams, and they came to past just as he said. And what did Joseph get for prophesying the reinstatement of Pharaoh’s cupbearer? Forgotten. But God did not forget him. Joseph’s integrity, paired with God’s favour, caused him to be brought before Pharaoh to describe and interpret two troubling dreams he had. His gifts literally made room for him (Proverbs 18:16). But not only that, his integrity with Potiphar and the prison warden enabled him to rise above his unfair lot in life. God gave Joseph the description and interpretation of Pharaoh’s dreams to Joseph which pleased Pharaoh, intimidated Pharaoh’s courtiers, and caused the young Hebrew to be promoted to the position of governor or prime minister over all the land of Egypt. Most may believe that this is the end of Joseph’s testing, but that is not true. The last true test involved how he treated his family after he’d ascended to the second highest throne in the land. When a famine prophesied in Pharaoh’s dreams came to past, Joseph’s brothers were driven to Egypt to buy grain so their families wouldn’t starve. He could have had them thrown them into jail without a moment’s thought if he had allowed himself to harbor unforgiveness in his heart. He could have given them a punishment to fit the crime and it would have been just by man’s law, especially with all of Egypton his side. But Joseph had integrity. He tested his brothers, made sure his full blood-brother was still alive, blessed them, and bade them return to Egypt permanently. In every level of testing, “from the pit to the palace”, Joseph never forgot his God or his integrity. I would that so many of us were as steadfast! 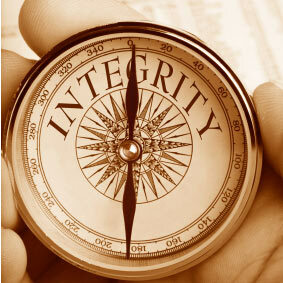 Joseph’s integrity seeped into every aspect of his life; in fact that is what the word denotes. It means to be whole; the same through and through. And the truth of the matter is, if Joseph did not have good character in one area, it would have eventually seeped into the other areas of his life. Like a beverage spilling onto a pile of napkins, the liquid will not stay on the top, but seep further and further down until every layer of the pile is affected. So what does your life look like? Do you lie to your kids or spouse? You’ll start to lie to your employees. Do you list tax write-offs that shouldn’t technically be added to the list? You’ll likely start mismanaging your company fund or finances. Whatever your problem area is, you first need to admit that it is a problem or even a sin, depending on what the issue is. God can fix it if you let Him. And when He does, you have the opportunity to right your wrongs and become true person of integrity. 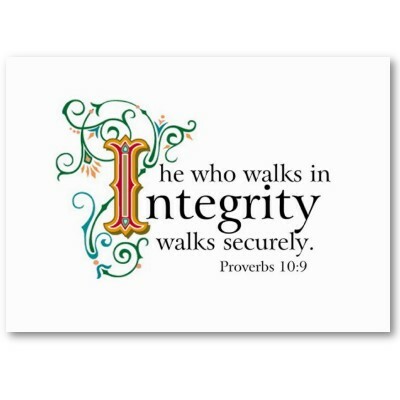 When you operate in integrity, God will bless and favour you like He did Joseph. Whether people acknowledge your character or not, God will and He will do it for all to see. 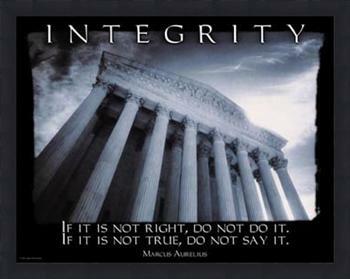 Choose now to live a life of integrity! 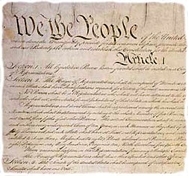 “qualities (as adherence to duty or obedience to lawful authority) that together constitute the ideal of moral propriety or merit moral approval; something to which someone has a just claim; the power or privilege one is justly entitled to; something that someone may claim as due; the cause of truth or justice”. You—whoever you are, wherever you’re from—have the duty, claim, power, privilege, and entitlement to write. It is our gift and privilege as human beings to be able to take our thoughts, emotions, wisdom, and advice, record it—either by ourselves or with the help of someone else—and present it to the world. “If we look at writing as serving, [it] will probably change our perspective on it”. We must serve our gifts to the world. What good will keeping it to yourself do? You may not be the number one person in your industry; you may only be a young entrepreneur like myself, but you can help someone. You can encourage someone. You can help someone avoid the mistakes you made along the way. Experience is a great teacher, but sharing wisdom makes you a greater teacher. Rabbi Daniel Lapin is a wonderful man and author of several books such as Thou Shalt Prosper has a very different spin on entrepreneurship and life than many do. He believes that to tell someone to study and do what makes them happy. 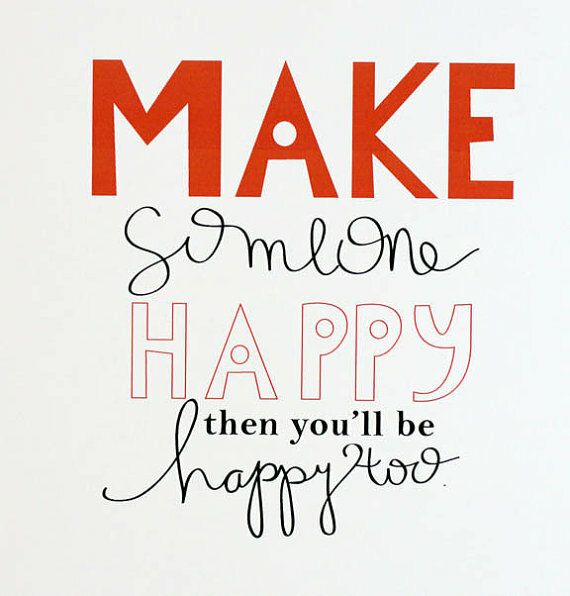 Instead, you should serve people by meeting a need and that, in turn, will make you happy. Take your writing and or entrepreneur giftings, share them, and serve them to your fellow man. You will change someone’s life and be happier than the popular, yet selfish mindset of simply doing what makes you happy. What you feel makes you happy is subject to change; making someone else happy never changes. That is the true pursuit of happiness; not just for you, but for the world. It is your inalienable right. 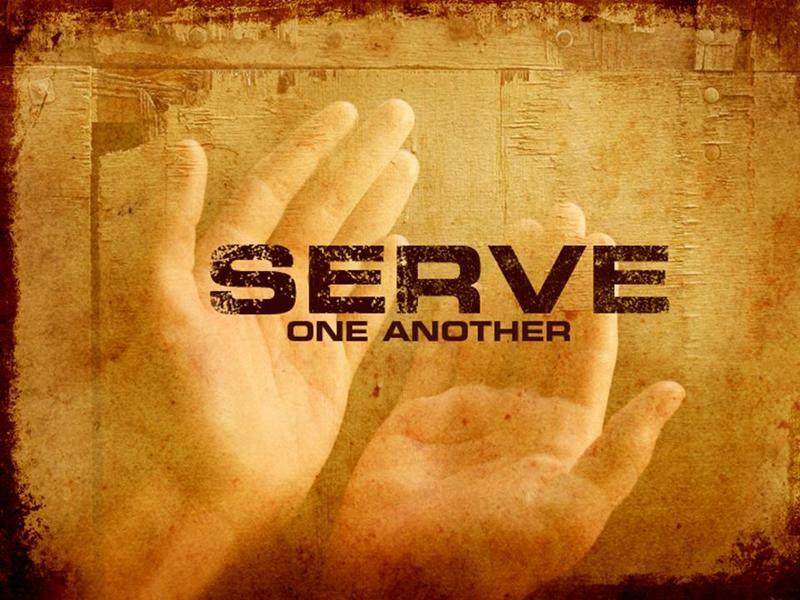 Last and most importantly we are commanded to serve our gifts. How? Where? Great question. In March, I was able to visit Orlando, FL and hear one of my favourite ministers, Bishop Tudor Bismark preach. He taught a new sermon of his entitled “Be Fruitful and Multiply”. 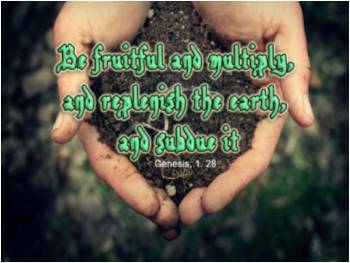 In it, he illuminated to us that the first thing God said to [man] after He created us was “be fruitful and multiply”. He also walked through the rest of Genesis up to Jacob’s blessing his son Joseph’s sons, Ephraim and Manasseh. Now most people think that “be fruitful and multiply” means to have a lot of babies. And though I do not disagree with the truth of that statement, it does not stop there. We are to multiply in love, kindness, finances, and yes, our gifts. In the Book of Matthew, Jesus tells a story about a man leaving his servants with talents (money). One had five, another two, and the last one. The first multiplied his talent and when his master returned, was able to give him back ten. The second servant returned four talents to his master. However, the one talent man did not even invest that one; instead, he buried it and returned the single talent to his master. Let’s look at this story objectively: the men who multiplied their talents were considered faithful and given a reward for their faithfulness. The one who buried his talent had it taken from him, was considered “wicked and lazy”, and was punished. Some of you may find this unfair. Why should the one-talent man be punished for his fear and returning exactly what he was given? Because seedtime and harvest is a biblical—and logical—law. Illustration: How would you feel if you invested your money in a bank and at the end of the allotted time, you got back nothing more than what you’d put in in the first place? You’d be upset. You’d feel like you wasted your time as well as the investment; you could have put it somewhere else and gotten much more out of it. When God created plants and trees and flowers, He did so placing within them the ability to reproduce themselves—to multiply—without Him having to create them all over again (Genesis 1:11). He did the same with the birds, sea creatures, and land animals. Everything created has within it the seed to multiply. Therefore, if we simply maintain what we have, that alone is not acceptable to God. We are meant to multiply, increase, our talents and gifts. Don’t just limit your writing abilities to your personal journal, launch a blog. Write for a community newspaper. Start your manuscript—something! It’s the same with the fashionista, the history buff, science “nerd”, and more. Find what your gifts are, no matter how great or small, how popular or obscure—bar anything illegal of course—and serve them. Multiply them. And guess what? God will bless you! Why would you not want to usurp your God-given right to write, serve people, and make God happy? “Try Him in this” and see if He won’t bless you!